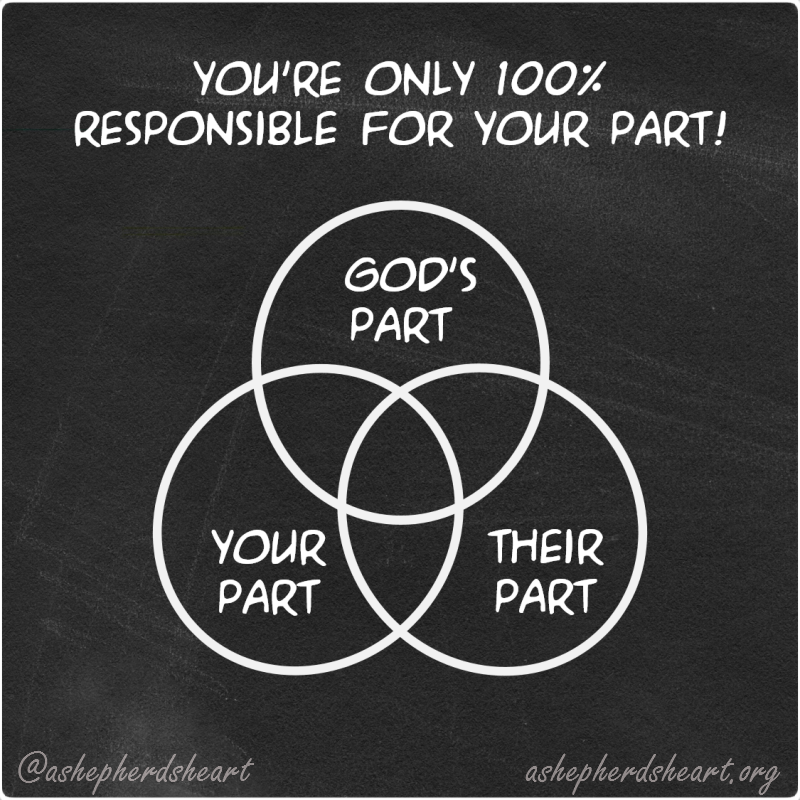 A Shepherd's Heart: Relationships: Learning What You're 100% Responsible For! Relationships: Learning What You're 100% Responsible For! Relationships can be tough. This is especially true when conflict exists. On the other hand, it can also be fantastic when thing are working the way they should be! This is true in any relationship in general whether a personal relationship with family or friends, in a business setting or in a mentoring, discipleship or counseling relationship. Speaking from experience in all of these before mentioned relationships, it can be great or it can be very very draining if you are the only one doing all of the work. We invest in people and people are worth pouring into as long as they actually do their part too! Sometimes it does take more time but there's always a need to keep a healthy balance. It can also be confusing sometimes because on one hand we shouldn't easily give up on people but in wisdom, we cannot have a "Jesus Complex" thinking we can "save" everyone because that's His job not ours. Our job is to be willing vessels and He'll give you the means and wisdom to do your part as long as it makes sense and to the point where it's not detrimental to you. So, you may be asking, what is my part then? What I'm about to share with you is something I learned a long time ago and have actively started to apply especially to discipleship relationships. This isn't something I came up with rather, I was taught this in various settings and it's very worth sharing with you as I know it will help you have a different perspective on things moving forward. Note in the diagram below that while all three parts interconnect...there is only one part that you own! What you need to understand is that no matter what, you are only 100% responsible For Your Part! You cannot own God's part and you cannot own anyone else's part. If you try to do so you will fail every time as you're not meant to shoulder everything because let's face it, even though we're to follow Christ and reflect Him in all we do...we aren't Jesus. So, if you have a "Jesus Complex" thinking you can fix everything and everyone let me tell you to simply...STOP IT! It's unhealthy and unless others do their part...their 100%...nothing will change! 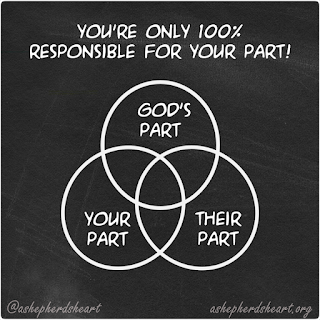 Now, I'm not talking about God's Part because He always does His part but I'm talking about the "THEIR PART"...in other words, the other human being involved. You just can't own their part! Even in a specific situations you're only 10% at fault and the other person is 90% at fault, you can only own 100% of the 10% that is yours. Let me me shift gears and focus for a few moments on those who have been or are in a counseling or possibly discipleship relationship with someone. There likely will be a point where you realize that the other person in the equation isn't doing their part at all. Now, they may say they want to grow and their words say to do but their actions say otherwise. For instance, anything you give to them to do or suggest to them to do...they never do it and maybe even state excuse after excuse. You also see that they aren't bearing fruit from it as they aren't owning their own growth. In this and other situations you have to lean on God's wisdom in all things and in this type of situation, you may have to end the counseling or discipleship relationship because it's going nowhere and this person it potentially taking time away from you pouring into someone else who really does want to grow and have life change. This may sound harsh to some but it's realistic wisdom. You are owning your 100% and they simply aren't so it's no longer worth your time after so many months of effort with no effort by those who "want your help". You simply cannot "Make" someone grow or experience life change. Either they want it or not and if they aren't owning it, you have to make the determination if you should continue down the path with them or not. I'm sharing this from many of my own mistakes, which maybe you've experienced too, where I didn't see what was happening and maybe I was blinded in my zeal of never giving up on anyone but the reality was I was not giving up...I wasn't hearing God tell me that I needed to face the reality that the season needed to end. I remember in these seasons that I was so drained and wondering why?! Well, in part it was because I was pouring everything into them and trying to own it all and they didn't own their part. Again, we can only own our 100% and that's it! The same is true of pretty much any personal relationship that you want to grow. Each party has to own their part for the success of the relationship because if they don't, it may eventually become strained and worse yet, it will completely fall apart. No matter what, you have to learn that you're only 100% responsible for your part! You are responsible for yourself, your actions and attitudes. So, own your part, God will definitely own His and leave other people's part the "their part" to them and pray that they own it because you simply cannot. I pray that God helps each of us grow in wisdom so we may grow in understanding differentiating each of these part while completely owning our own. Share this truth with someone today: In any relationship there are always 3 Parts: God's part, Your Part and Their Part. Always remember that you only own 100% of your part.